Purchase online U30D20C Fast Ultra-fast Diode in India at low price from DNA Technology. 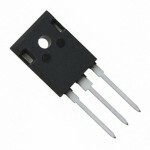 U30D20C is a 30 Ampere dual common cathode ultra fast recovery rectifiers. U30D40C Ultrafast DiodeFeatures of U30D40C DiodeGlass Passivated Die ConstructionSuper-Fast Switchin..